The first-ever Runaway Bridesmaids race happened this Saturday at The 5th Avenue Mile in New York City. 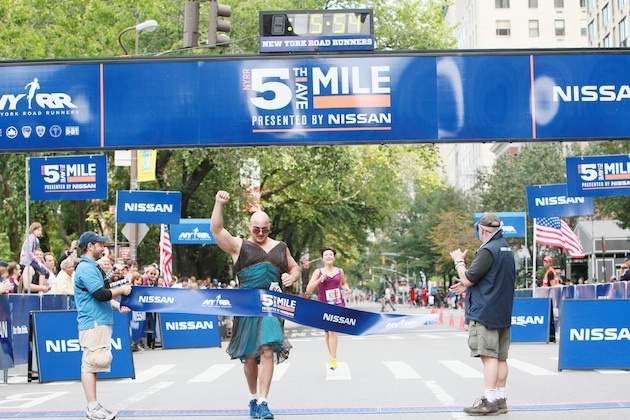 The men and women who dressed up and showed up made the race so much fun–and such a success. And they all looked beautiful doing it! Grand Prize Winner: A big congrats to Mr. David Tropiano for raising nearly $1500 on Crowdrise. He wins an trip to the ancient ruins of Machu Picchu in Peru (hotel, food, air fare included). Thank you to Adventure Life and Airline Ambassadors for sponsoring the prize. First place finisher: Congrats to Mr. Matthew Daniele, the big guy in the green dress who, despite all the cat calls from the women on the sidelines, persevered to win first place in the Runaway Bridesmaids heat with a 5:54 mile. Furthest Traveler: We had runners from DC and Philly come to NYC especially for the Runaway Bridesmaids event. The RB runner who traveled the furthest distance to be here for the big race is Lindsay Hartfiel, who flew in from Wisconsin. She’s the editor of Native Foreigner magazine. Best accessories: Stephanie Meyers, who not only ran in a lemon-yellow bridesmaids dress, but who was perfectly polished with her pearls and cute little clutch. Way to tie the look together Steph! Biggest trooper: Barry Vargas, for completing the mile despite a recent knee surgery. Barry, you are amazing! The Man Who Looked Best in Purple: Cheers to Darren Garnick, who rocked that purple dress all the way to the finish line. Best guy in sequins: Kevin Brennan vowed to his wife Jen that he would do the mile in a dress only if we raised $7500 by race day, and we were so close that he slipped into a little silver sequined dress for the run–and continued to wear it all day at the after-party at Connolly’s Pub’s. I could go on, but let’s just say the day was awesome and I can’t wait to do it again next year. Cheers to our Runaway Bridesmaids team for an amazing race! !